Last week, I went on a business trip. At least, that's what I told my family as they were packing backpacks and files in preparation for school and meetings. I was gleefully chucking rain gear into an overnight bag and impatiently waiting to hit the road. I was headed to the Alaska State Fair on opening day to eat as much food as possible. That's a business trip, right? No, my kids didn't buy it either. Some people go to the fair for the rides; some to kick tractor tires; some for the concerts; and some to pet a llama. But almost everyone goes to the fair for the food. The fried, the baked, the crispy, the salty, the dusted with powdered sugar: everyone has a favorite. I have my own. So, I was bound and determined to only write about foods that haven't made it into my previous State Fair food roundups. And I succeeded with only one exception. So you can check previous roundups to get my feelings on: pork chop on a stick, chip loafs, loaded baked potatoes, Talkeetna Spinach bread, Reuben sandwiches, Denali Creampuffs, Hoopadoodle cookies, and fried pickles among others (spoiler alert: I have good feelings about these things). I scanned the fair map, did a crowd-sourcing effort on Facebook and asked anyone who would sit still for his or her favorite fair foods. I made a careful plan and then called in my friend Kim to be my right-hand on my culinary escapades. She said yes because she's the kind of person prepared to make great sacrifices in the name of friendship. And because she loves corn fritters. Our first bite of the day proved to be our hands-down favorite: Rocky's Killer Shrimp (which shares a space with Rae's Gourmet Tamales). The time was 12:01 p.m. but the line was forming quickly. It's hard not to notice the giant bowl, containing whole sticks of butter, that stands at the ready next to the cast iron wok where the shrimp is cooked to order. It's best to look away as it is added, because ignorance is bliss. And so is this dish. In my bowl, well over a dozen Alaska side-striped shrimp swim in a buttery Cajun broth with earthy herbal undertones and the exact right level of spicy kick. This is one of the messier fair foods (or, anywhere foods) because the slippery little shrimp are served in their shells. At this point, Kim and I decided that table manners have no place at the fair and fished into the bowl with our fingers and stripped the shells to get to the sweet shrimp meat. I think I ate a few shells in the process but was none the worse for wear. The bowl is served with a generous portion of soft, spongy bread to soak up the remaining broth, and when there was still a tiny bit left at the bottom, we took turns sipping it. The amount of garlic at the bottom of the bowl was rather a shock so maybe get this dish AFTER your romantic plan to kiss at the top of the Ferris wheel. We moved on to the nearby Friar Tuck's corn-on-the-cob stand. 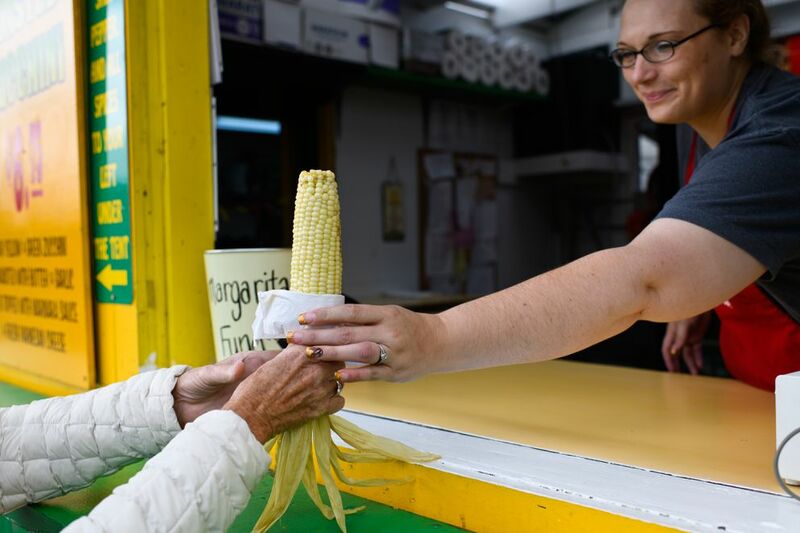 It's a fair staple that I'm always excited to bite into because, for some reason, corn always tastes sweeter, plumper and juicier at the fair. Best of all, there are elaborate fixings at the bar that allow you to customize your cob. It's an excellent setup: a long table with lots of elbow room; a metal grill over which you can shake your seasonings; and myriad spice blends and flavorings to add kick to your kernels. Garlic salt, lemon pepper, Parmesan cheese, Old Bay, Cajun, and our favorite of the day, called, vaguely, "Soul Food Seasoning," were just some of the choices. Undecided? You can do what we did: Season. Bite. Re-season. Bite. Rinse. Repeat. Our appetites temporarily sated, we wandered over to The Red Beet, one of the most charming booths at the fair, for a break from the rain and a little retail therapy. A shabby-chic boutique/restaurant with wholesome menu offerings like smoked salmon on toast, a seared pork and carrot sandwich, and State Fair Stew, the smell of which almost helped me to regain my appetite. But cooler heads prevailed and we vowed instead to pick up some baked goods on the way out. The Red Beet has, hands down, the most adorable dining spot at the fair – a cozy little upstairs dining nook offering optimal people watching and a nice break from the overall hustle and bustle. Our errands done, we headed for the Irwin Exhibits to check out the children's art and crafts (adorable), the prize-winning pies (appetizing) and the homemade quilts (spectacular). I care about homemade quilts for exactly one day out of the year. But on that day, I care passionately. By this time it was one (wine) o'clock so we ambled over to The Wine Bar for a strategy meeting and a couple of glasses of pinot noir ($8 a glass). We made the obligatory "day-drinking" joke to our genial bartender, who reassured us that earlier patrons had already been ordering by the bottle. The wine bar is a thoughtfully designed and decorated oasis with a low-lit, soothing atmosphere and a smattering of tasteful bling. It's a perfect spot to press the re-set button – away from the noise, smells and action of the fair at large. They do offer some menu items but we begged off – we had (literally) other culinary fish to fry. We headed next to the commercial building where we had our rings cleaned, our hands moisturized and wrote notes to our senators. All that hard work left us feeling hungry. Dining on your feet somehow leads to a constantly renewable appetite. Our next stop was at The Crab Shack. 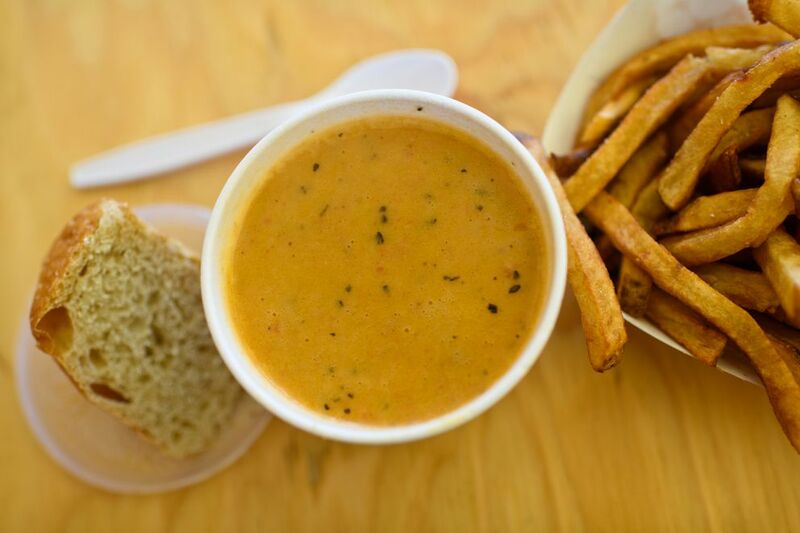 I've eaten and enjoyed their crab cakes in past years, but the rainy weather inspired us to opt for the crab bisque instead. This was a body and soul-warming dish: creamy and decadent, with rich crab flavor. It's served with a slice of sourdough bread, which we used to sop up the last remaining drops (Cup $9.50 in a bread bowl $12.50). 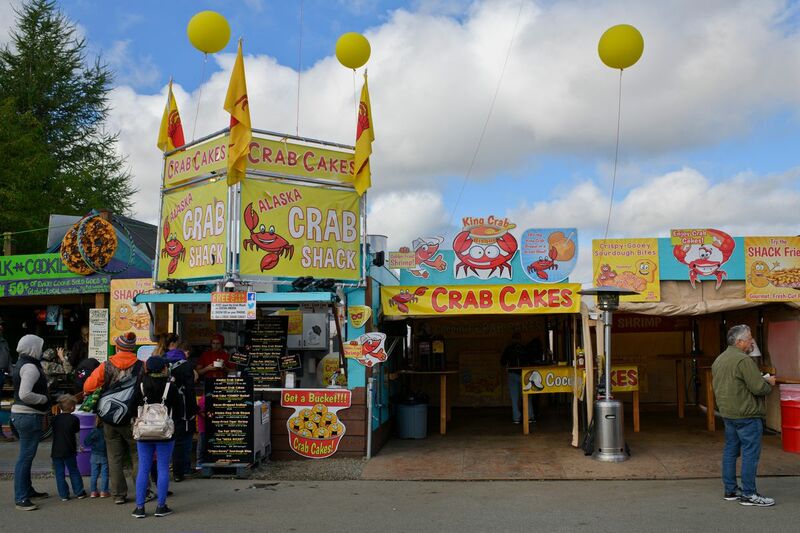 Side note: The Crab Shack has one of the larger, better-appointed and more convivial eating areas at the fair. Added points for wet wipes on the tables. We meandered past the new, snazzy Lucky Wishbone booth and I had to remind myself that I have already written long and lovingly about this fried chicken mecca. I was glad to see them there but we walked resolutely on. 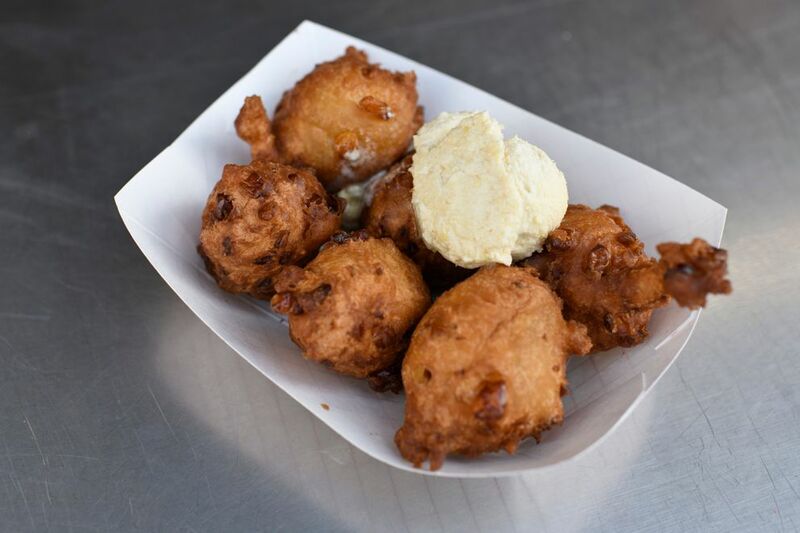 We opted instead for a shared plate of corn fritters from Big Dipper Concessions. We'd had fresh corn, and now we were ready for, let's face it, dessert corn. There was not much to say about fried little balls of dough packed with sweet corn kernels and served with honey butter. There was not much to say because our mouths were stuffed with these simple, decadent fair staples. Nostalgic, filling, perfectly sweet. I can't walk by the Red Bird Thai Kitchen without picking up an order of boiled peanuts ($8). My family doesn't understand my fixation on these but, hey, the entire American South can't be wrong, can they? I love how the peanuts turn tender and edamame-like after their hot, salty bath. They're hard to walk around with because shelling these suckers is a messy business. But they're a lot of fun to eat because shelling these suckers is a messy business. So, we grabbed an order and headed over to the Sluice Box for the perfect boiled peanut accompaniments: cold beer and a Rolling Stones cover sung by Silver Train. We were running out of room (and energy) as the evening rolled in, along with heavier rains, so we decided to grab the last two items on our to-eat list on the way out. First, we stopped by Yukon John's Pork Rinds (new this year) for a bag or two of this truck-stop delicacy. I opted for Cajun and barbecue flavors and they proudly noted, "Just made today!" as they handed the bags over ($8 for each, $30 for 4). Lastly, we headed to The Boardwalk for the peach pie I didn't save room for. When I remembered that I would be hosting a sleepover later that weekend, I opted for the whole pie ($27). As proof that the Alaska State Fair is the gift that keeps on giving, I broke those rinds out at a friend's bonfire the next day and became an instant guest of honor. Crispy little clouds of porky goodness, these were light and ephemeral. They were seasoned just right, adding enough spice and sweetness to add interest without overwhelming the delicate flavor. When we broke out the peach pie, my younger daughter was insistent that she didn't like pie. She was nagged into trying a bite and was converted by its balance of tartness and sweetness, and its flaky and buttery crust. She then claimed she didn't like melted ice cream. She was nagged into an a la mode version of the pie and was converted again. I'm not saying that this pie is like a religious experience. But I am saying it changed a few minds. It was a long, relaxing and delicious day (if a bit soggy). Honestly, I don't know why people complain about traveling for work. I find it delightful.